A lot of dogs have done admirable and heroic acts. We’ve seen that mother dog who found a baby, and saved it’s life by keeping it warm. And did you see that video that tells the story about a blind dog rescuing a drowning girl? That was amazing! We found another hero dog who saved a baby’s life! 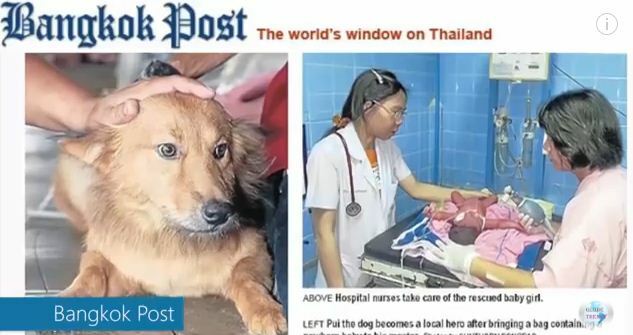 In Thailand, a dog named Pui rescued a newborn baby from the trash dump. Pui found a plastic bag that had a baby in it. Somehow, Pui knew that there was a baby in the bag, so he brought the bag home with him. Pui showed the bag to his owner, who then went to the hospital and informed the authorities. Watch the video below for the full story! Pui is a hero! He was given a new leather collar and medal from the Red Cross for saving the baby’s life! And I believe he deserves a lot of treats too! Don’t you agree? Leave a comment for this hero dog!